ECONOMIC DEVELOPMENT 3 2 | B R O A D B A N D C O M M U N I T I E S | w w w. b r o a d b a n d c o m m u n i t i e s . c o m | A U G U S T / S E P T E M B E R 2 0 1 8 Impact of CAF II–Funded Networks Two typical rural exchanges are likely to remain underserved even after upgrades supported by the Connect America Fund. This study, conducted by the Blandin Foundation, concludes that CAF funding is insufficient to support rural economic development and that more transparency is needed if states and localities are to supplement CAF funds strategically. By Bill Coleman / Community Technology Advisors A merica is plagued by a stubborn and growing rural-urban digital divide: irty-nine percent of rural areas lack access to broadband of 25 Mbps download/ 3 Mbps upload, compared with 4 percent of urban areas. is opportunity gap is a significant barrier for people who live, work and learn in rural communities. In contrast, communities served by gigabit networks experience clear economic benefits. Making investments to close these rural- urban gaps can be a challenge for large telephone companies. e returns on investment in rural exchanges are rarely competitive with those in more densely populated areas, as high costs for network infrastructure often outweigh possible short-term economic returns from a small, dispersed customer base. e FCC's Connect America Fund (CAF II) program is designed to close the financial gap so large carriers, regulated as price-cap carriers, can improve broadband services in areas otherwise too expensive to serve. ese carriers have accepted payments from the FCC to deploy broadband services to a targeted number of households in their service areas. Over the five-year program, four companies serving rural Minnesota will receive federal funds for broadband deployment. Construction using CAF II dollars began in 2016 and must be complete by the end of 2020. Service providers must offer broadband at speeds of at least 10 Mbps downstream and 1 Mbps upstream and meet other performance and pricing requirements. But is CAF II funding adequate to encourage providers to deploy networks in less densely populated exchanges that deliver services comparable to the networks they build in more densely populated areas? ere is reason to believe the funding is not adequate. ough new FTTP networks provide the best infrastructure platform for robust rural connectivity, rural fiber deployments can range from $4,000 to more than $10,000 per passing, depending on population density and terrain. However, in Minnesota, CenturyLink is receiving $2,354 per household and Frontier $2,936 per household. 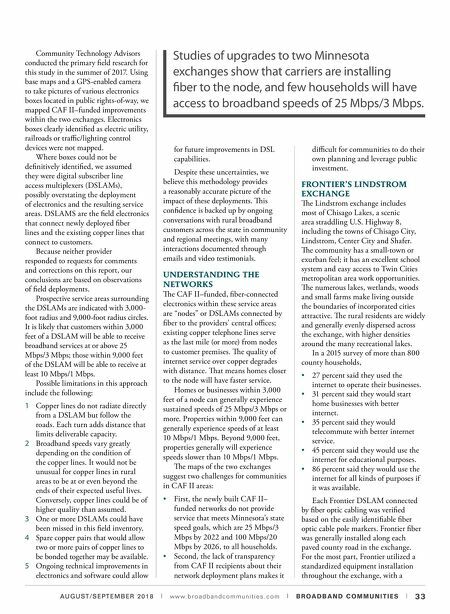 A STUDY OF TWO EXCHANGES is article examines CAF II–funded broadband network deployments in two rural Minnesota telephone exchanges, one (Lindstrom) owned by Frontier and the other (Braham) by CenturyLink. ese exchanges contain characteristics seen throughout the state. Both are quite rural, with small cities, farms, exurban and rural homes, wetlands and lakes. Of the two, the Braham exchange is the more rural and less densely populated.